As a scientist with an active research program on Goliath Grouper, a SCUBA diver and a Floridian, I’m writing to express my concerns regarding the possibility of lifting the 1990 federal and state moratorium on harvesting Goliath Grouper which is currently under discussion at the Ad Hoc Goliath Grouper Joint Council Steering Committee meeting January 7-9, 2014. I understand some representatives of the fishing lobby are pressuring you into reopening the fishery for Goliath Grouper. They label the reopening with different names: “scientific take”, “culling”, “selected take” etc. Such pressure was behind the repeated proposals to reopen the fishery in 2007, 2009 and 2011, all discussed at FWC meetings, and all defeated in view of scientific evidence. At the start of 2014 we face once again demands to reopen the fishery. The reason most frequently used to reopen a recreational take of Goliath Grouper is the perception that Goliath Groupers eat everything they encounter, and are responsible for declining fish and lobster stocks. This is an urban legend with no connection to reality. Solid scientific research (Frias-Torres 2013) demonstrates that overfishing, not Goliath Groupers are responsible for declining fish and lobster stocks. My paper also concludes that a recovering Goliath Grouper population can provide many ecological and socioeconomic benefits: 1) as top-down control on lobster predators: Goliaths eat predators of juvenile lobsters, allowing more lobsters to grow to legal size and making more lobsters available to fishers, 2) in ecotourism, as a sustained source of income for many small Florida-based diving businesses, restaurants, hotels and tax revenue for the state of Florida, and 3) as potential biocontrol of the invasive Indo-Pacific red lionfish Pterois volitans on Atlantic reefs, because Goliaths have evolved to feed on venom-spined and poisonous fish. 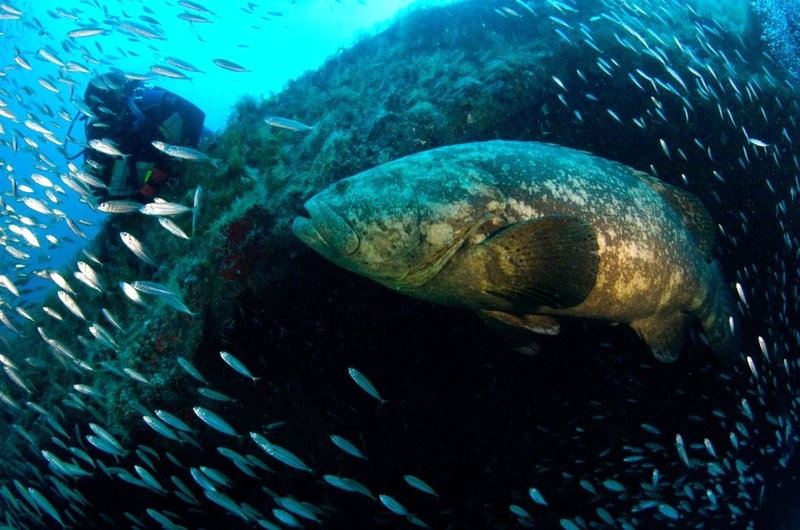 The current benchmark to evaluate Goliath Grouper recovery is set at the population level as it existed in 1950, because it assumes at that time the population was almost unfished. However, studies on historical ecology (Mc Clenachan 2009) demonstrate nearshore population declines well before 1950. Without taking into consideration a true historical baseline, the restoration target for Goliath Grouper is far too low. Since it’s publication the McClenachan (2009) paper has been included in all the FWC documentation related to Goliath Grouper meetings and assessments, and during my previous testimonials at those same meetings, I emphasized the problem with the current benchmark, yet , FWC, NOAA and the Councils insist on using an already reduced population as the restoration target for this species. Until this mistake is corrected, any claims made that the species has reached its recovery target are absurd. In the 2009 and 2010 winters, we had sustained cold water temperatures in Florida, and those were particularly extensive in mangrove shorelines. Roughly 90 % of the juvenile Goliath Grouper population died from exposure to cold water. This means, we are not going to have any new significant recruitment to the adult population (in the reefs) until 2016 or 2017, when we use the 7 year mark as the time when female Goliaths mature and migrate into the adult population (Bullock et al. 1992) . To help you visualize the magnitude of the Goliath loss, it will be equivalent to having 9 out of 10 children around the world, from newborns to 12 years of age (time of first menstruation for girls), suddenly die. That’s how much we’ve lost in Goliath Groupers in just two winters. This week, a portion of the arctic blast affecting most of the US has arrived to Florida. It remains to be seen whether this winter we are going to experience sustained cold water temperatures and a potential loss of juvenile Goliath Groupers. In 2010, a group of independent experts rejected the Goliath Grouper stock assessment. I attended the assessment meeting and provided information on my field-based research. One of the major handicaps was the disconnect between the model used as the centerpiece of the assessment, and the real life history of the species as studied by fish ecologists that spend time in the water with the fish itself. If fisheries scientists and fish ecologists are allowed to work together, we could develop a more realistic assessment of the population. We might have to develop new assessment tools, but by doing so, we’ll be opening a new era of improved population assessments not only for Goliath Groupers but for the entire grouper fish family. I strongly suggest you access the site and read the comments left by some of the people signing the petition, so you can learn more about the many reasons people want the Goliath Groupers protected. 2) The Diving Equipment and Marketing Association (DEMA), the international trade association for the recreational scuba diving and snorkeling industry, with more than 1,400 business members worldwide, has issued an official statement in support of continued protection of Goliath Grouper. The statement was sent to the Gulf of Mexico Fishery Management Council, and can be viewed here. Once my paper Frias-Torres (2013) was accepted for publication (in mid 2012), I invested a significant amount of time making the information available to the widest audience. I publicized the results through social media, I attended FWC and Council meetings and testified on the results of the research, and I was also interviewed by the UK-based BBC radio, http://www.bbc.co.uk/programmes/b01ntfvl and by the U.S. National Public Radio (NPR) http://stream.publicbroadcasting.net/production/mp3/wqcs/local-wqcs-984578.mp3 . As a result, the Goliath Groupers have acquired national and international exposure. I urge you to continue the moratorium on Goliath Grouper as recommended by scientific evidence. Bullock LH, Murphy MD, Godcharles MF, Mitchell ME. 1992. Age, growth and reproduction of jewfish Epinephelus itajara in the eastern Gulf of Mexico. Fishery Bulletin 90: 243-249.